Gripsweat - Duane Allman Skydog Retrospective. 14LP Vinyl SEALED #236/1000. Out of Print! Duane Allman Skydog Retrospective. 14LP Vinyl SEALED #236/1000. Out of Print! Duane Allman Skydog The Duane Allman Retrospective. 14 LP Vinyl SEALED #236/1000. Condition is New. Shipped with USPS Media Mail. Picture one is the photo of my personal copy. But as you can see from the other pictures, I haven't even pulled number 236 out of it's shipping box. THAT is even still sealed! This box set is going for $999 with some vendors. DON'T PAY THAT PRICE! IN THE UNITED STATES, shipping is $15.23. Outside of the United States, it will be more. Just not sure how much. I accept Pay Pal or bank check for full amount. Thanks for viewing!!! FROM PLEDGE MUSIC dot Com: "Buy the 14 LP box set; 180-gram vinyl; limited edition of 1000, individually numbered; 56-page book contains rare and never-before-seen photos with essays by Scott Schinder and Galadrielle Allman and get much more. 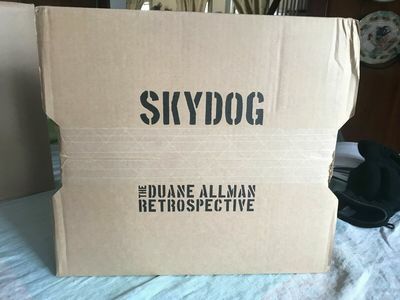 Produced by Galadrielle Allman and esteemed reissue producer Bill Levenson, Skydog features all 129 tracks from the original CD edition of the retrospective, including many classic Allman Brothers songs, plus a collector’s cache of rare singles and long out-of-print album tracks. The songs range from Duane’s early recordings (with Gregg) in bands such as The Escorts, Allman Joys and Hour Glass; to his studio work with Aretha Franklin, Wilson Pickett, Boz Scaggs and Delaney & Bonnie; to a live jam session with the Grateful Dead."